Compare Crepe Makers: Krampouz or CucinaPro? A crepe is a Breton variety of thin pancake cooked on one or both sides in a special utensil to achieve a texture of fine bubbles often compared to lace. Crepes are much thinner, more delicate, and according to most gourmets, taste better than the ordinary pancakes you get for breakfast at your favorite diner. Though crepes and pancakes may use similar ingredients, the ratios of these ingredients are different. The crepe batter has much less leavening in it and has to sit for about an hour before it can be used. Crepes are supposed to be thin and elastic while the regular pancakes should be thick and fluffy. Made with buckwheat or wheat, filled with sweet or salty ingredients, crepes have always delighted food lovers of all ages. The recipes are varied and can be used in all parts of a meal, be it as an appetizer, a main course or a desert. Electric crepe makers have a smooth non-stick surface that makes spreading the batter smoothly and evenly a simple job. Their non-stick surface allows for low fat cooking and easy cleaning. Electric crepe makers get your crepes ready much faster than stove-top crepe makers. Electric crepe makers often are equipped with an automatic thermostat that will heat the surface to the ideal cooking temperature. It will also indicate when the crepe is ready so you get that perfect crepe each time. 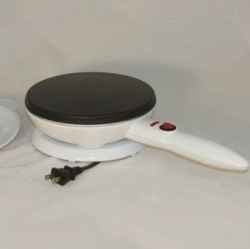 The two most common types of electric crepe makers are the griddle type and the dipping plate type. The next sections describe and compare these two types of electric crepe makers and the best product of each type, respectively the Krampouz and the CucinaPro. Otherwise continue reading the comparison below. Griddle type electric crepe makers consist of a round (about a foot wide) flat surface with an electric heating element inside.The picture on the left shows a griddle type crepe maker with the typical wooden tools that it usually comes with: a spatula used to turn the crepe over to cook both sides, a scraper used to spread the batter evenly over the cooking surface, and a cleaning brush. The best and most popular griddle type crepe makers are manufactured by the French Krampouz which is the world reference for crepe makers. The Krampouz Tibos model, shown in the picture, is 13-inch in diameter and has a non-stick smooth surface that allows to spread batter evenly. The 1300-watt heavy duty unit is equipped with a cursor regulated thermostat and a heat indicating light. It comes with the usual spatula, scraper, ladle and cleaning brush. It takes just a few seconds to spread the batter and about 30 seconds to make the crepe. It also comes with complete instructions and recipes. 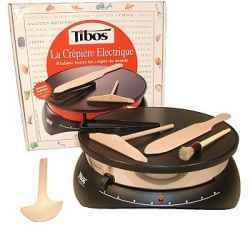 The Krampouz Tibos crepe maker is very easy to work with and to clean. It only takes a few tries to get the hang of it and make great crepes while having lots of fun making them. A dipping plate type electric crepe maker (shown on the right) usually come in three parts: an electric base, a dipping pan and a cordless cooker plate. The base is used to heat the cooker plate, and the dipping pan is used to apply the batter to the surface of the cooker plate. You pour some batter into the dipping pan, then brush slightly the surface of the cooker plate with a little bit of butter. You flip the cooker plate down and dip it into the pan containing the batter so that a thin layer of batter sticks to the cooker plate's surface. Then you flip the cooker plate over, place it on the electric base, wait until the crepe is cooked. Usually, an indicator light comes on when crepe is ready. With these crepe makers there is no need to spread evenly the batter over the cooking surface like you do with griddle type crepe makers. The batter simply adheres evenly to the cooker plate when it is dipped into the batter pan. 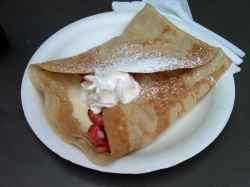 Since with this types of crepe makers the cooker plate needs to be lightweight, they usually make 7 to 8 inch crepes. ​Dipping plate electric crepe makers made by CucinaPro are the best and most popular in their category among Amazon buyers. The CucinaPro 1447 crepe maker is shown in the picture here. The cordless cooker plate that comes with this 800-watt crepe maker is 7.5 inches in diameter and has a non-stick cooking surface. It comes with an electric heater base, a batter dipping pan, and a spatula. It can make perfect paper-thin crepes in seconds without having to deal with a disturbing cord. The cooker plate can be placed in any direction on the round power base. The non-stick surface enables low fat cooking and easy cleaning. A recipe book is included. Note that CucinaPro also makes griddle type crepe makers (see Amazon products section below). So which type of crepe maker to buy? With the CucinaPro cordless dipping plate type crepe makers, there is no need to spread the batter manually on the cooker plate, and there is no cord to worry about. They are also cheaper than the Krampouz griddle type crepe makers. On the other hand, since the cooker plates of dipping plate type crepe makers need to be lightweight, they are smaller in diameter, and hence can only make smaller crepes. They are also not as powerful as the griddle type crepe makers. Finally, from a quality and durability point of view the heavy duty Krampouz is preferable to the CucinaPro dipping plate type crepe maker. So, both products have their advantages, but even if one can make great crepes with the dipping plate type CucinaPro, there is no doubt that for a serious crepe lover who will use the appliance often, and who does not want any limitations in terms of crepe size and cooking power, the Krampouz griddle type crepe maker is the right choice. You will find below on Amazon both the griddle type and dipping plate type crepe makers described above. Please click the selected crepe maker below to check the price or to purchase. Melt the butter over low heat and reserve warm. In a bowl, combine the flour and the salt. Make a well in the center of the mixture and break in the eggs thinned with a full glass of milk. Add the sugar at this stage for sweet crepes. Mix the mixture with a whisk. When the dough appears homogeneous, add gradually the remaining milk and the melted warm butter and continue mixing with the whisk. The dough should now have the same texture as water, and there should be no lumps. Let stand at least 1 hour at room temperature before using, and serve it with your favorite sweet or savory filling and garniture. If you prefer, you can add the cream by subtracting the same amount of milk. You could also add a few drops of vanilla for extra flavor. If you are looking for a variety of delicious crepe recipes, don't look any further! Martha Holmberg is specially qualified to bring crepes into your kitchen. Her lifelong interest in crepes is apparent throughout this collection of 50 sweet and savory recipes. Her clear and simple instructions and expert formulas produce delicious crepes, fillings and sauces that you will love preparing again and again.